Best-selling author Tracy L. Darity, finalist for the Multi-Cultural Literature Advocacy Group's, Best New Fiction Author Award, follows-up her debut release He Loves Me He Loves Me Not! with, Love...Like Snow In Florida On A Hot Summer Day. Fans of Darity's powerful flare for story-telling are set to become engrossed in another great story filled with true-to-life dilemma's dealing with love, betrayal, and commitment. When LaDamien Bryson takes stock of his life, he realizes he needs someone to share it with. In his late thirties, he is unmarried and childless. He decides it is time to take a wife. In Kim Friar he finds a smart, devoted, and nurturing woman whom he feels is just as good of a candidate as anyone else. The two quickly wed, and a year later their daughter Ariel is born. Fast forward and in walks Mya Blake, a woman LaDamien once desired years earlier. Faced with honoring his commitment to Kim, or pursuing what he believes is a love of a lifetime, LaDamien makes a drastic decision that causes three lives to become intertwined and sets the stage for a dramatic battle for his affection. Love...Like Snow In Florida On A Hot Summer Day pits wife against mistress and forces a husband into a struggle to maintain control of his home while trying to hold on to the love of both women. Families choose sides, friendships are taken through the fire, but the unsuspecting twist to this phenomenal novel will leave readers speechless. 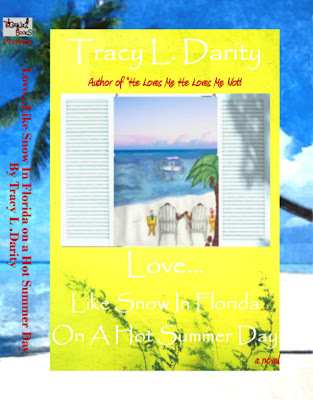 Tracy L. Darity self-published her debut novel He Loves Me He Loves Me Not! ten years after penning the manuscript. She was inspired to follow her dreams after attending the 1997 Essence Music Festival and meeting authors Michael Baisden, Tananarive Due, and Eric Jerome Dickey.